At Southeastern Alliance Underwriters (SAU), our experienced local agents and team are committed to providing insurance that is focused on you. Our 40-plus-year-old agency serves you with more than 250 years of combined insurance experience in Myrtle Beach, Conway, North Myrtle Beach, Pawleys Island, Loris and all along the Grand Strand. Our efficient and friendly insurance staff takes pride in offering you cost-effective insurance solutions with our focus on keeping the cost down with proper coverage protecting you and your family. 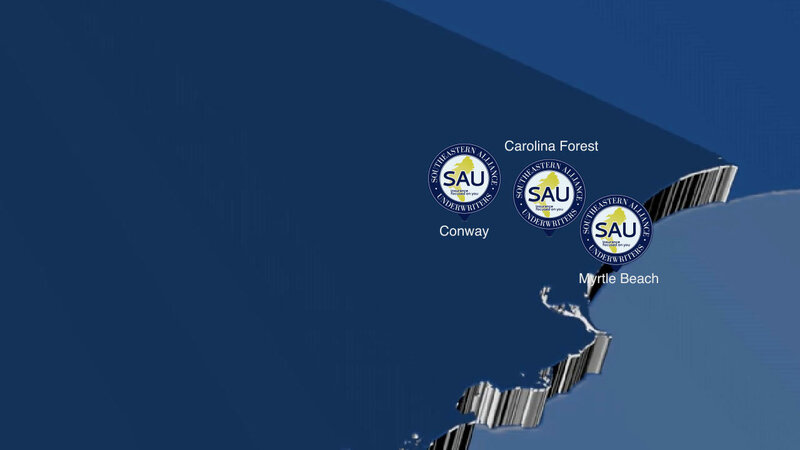 We have four office locations conveniently located in Carolina Forest, Conway, Myrtle Beach and North Myrtle Beach. Whether you are in need of home, auto or business insurance, our well-informed insurance staff will shop the markets for the best insurance rates/coverages available anywhere in Horry, Georgetown or Brunswick Counties. We have every competitive home insurance market from oceanfront home insurance with wind included in Myrtle Beach to farm insurance in Marion. Additionally, we have markets that will accept stand-alone wind and hail with flat hurricane deductibles. Not only does this help you avoid being written in the state insurance pool, but there is also no mandatory flood requirement to get replacement cost on one of your biggest assets. Let us show YOU why people are switching to SAU by simply giving us an opportunity to earn your business. For more information about home, auto or business insurance in Myrtle Beach, contact our team today. Want to expedite the process? Fill out the interactive form to receive a faster and more accurate quote. One of our local agents is standing by to talk with you. Please call us at 843.903.0202.